Is the German Pinscher right for you? Find your perfect match now! German Pinschers are a dashing and distinguished-looking breed. 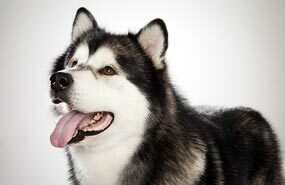 They are muscular, confident, assertive, and intelligent dogs. Originally bred as a working dog—specifically to catch rats and other rodents—the German Pinscher is now primarily valued as a courageous watchdog and loyal companion. Originally from Germany, this medium-sized and high-energy breed can grow to between 25-45 pounds and lives an average of 12-14 years. The breed is recognized by the American Kennel Club and classified as a member of the Working group. WHAT IS A GERMAN PINSCHER'S PERSONALITY LIKE? German Pinschers are a lively, affectionate, and playful breed that love to spend time with their chosen people. They are at their best when supervised with children and other dogs. Their prey drive makes them less than ideal housemates for other pets, particularly small animals. WHAT IS GERMAN PINSCHER BEHAVIOR LIKE? This is a very active breed that will require vigorous daily exercise. German Pinschers are energetic and enthusiastic athletes. These dogs are vigilant, territorial, and protective of their homes and families. German Pinschers bark with purpose — usually to let you know that you have guests or when those guests are out of line. HOW EASY IS IT TO TRAIN A GERMAN PINSCHER? German Pinschers are a clever, biddable breed. These dogs learn quickly but are strong-willed. Be patient, gentle, and consistent while training. Early and frequent socialization will help direct their mischievous impulses in a positive direction. It's important to keep their active minds and energetic bodies adequately stimulated. They respond well to praise, food, and play rewards. German Pinschers excel at dog sports, including obedience, rally, agility, and tracking. HOW MUCH DO GERMAN PINSCHERS SHED AND WHAT ARE THEIR GROOMING NEEDS? 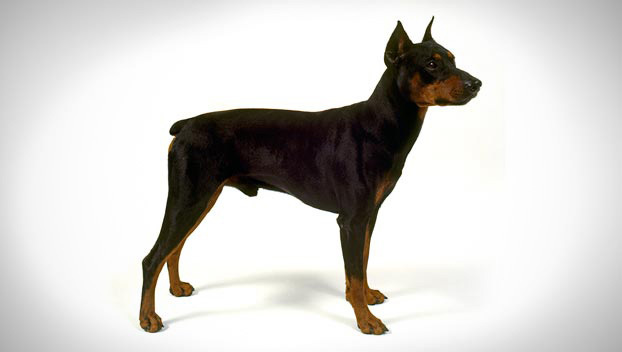 German Pinschers' short, single coats are smooth and dense. They require only occasional grooming. Plan for weekly brushing; bathe your furry friend as needed. They are seasonal shedders. WHAT HEALTH PROBLEMS DO GERMAN PINSCHERS HAVE? German Pinschers are usually fairly healthy. Some develop eye ailments, hip dysplasia, and von Willebrand's Disease. ARE GERMAN PINSCHERS GOOD FOR PEOPLE WITH ALLERGIES? The American Kennel Club doesn't list German Pinschers among its breeds recommended for allergy sufferers. You can reduce your furry friend's impact on your allergies with frequent baths and brushings to reduce loose hairs and allergy-aggravating proteins in your pet's dander. Use a damp cloth to wipe off your dog after playing outside. Smaller dogs have less surface area, so they produce comparatively less dander than larger breeds — definitely something to keep in mind with a dog like a German Pinscher! Remember that no breed is 100% hypoallergenic, and any breed can aggravate allergies. WHAT'S A GERMAN PINSCHER'S BEST DAY? Outside backyard play, all day long. After she exhausts herself, she'll be nuzzled at your feet for the perfect end to the perfect day. SHOULD I ADOPT A GERMAN PINSCHER? With enough exercise, a German Pinscher can live in a rural or urban environment, but they'll appreciate a well-fenced space for playing and running. They don't do well in cold climates, but thrive in the heat. These intelligent, playful, affectionate dogs require very little grooming and make wonderful companions. If you've decided on a German Pinscher, it's important to prioritize training and exercise to keep this dog's busy brain and restless body stimulated. This breed will do best with someone looking for a canine companion who's always on the go! Have you decided that a German Pinscher is the perfect dog for you? Why not be your new best friend's hero and adopt a rescue! Be sure to check out our article on what to expect when you're adopting a dog or cat.